Craig asked me to write up my experience at this year’s Where’s Waldo 100K. Overall, the course was nothing but AWESOME single track soft-duffed forested trails that any TRAIL ultra runner would salivate over. The steep grades and rolling stretches also gave it a nice challenge to endure. But what’s so big about Waldo Lake? Why not Odell Lake or Davis Lake? Waldo Lake is one of the deepest lakes in the country (second in Oregon) and is one of the most dilute large lakes in the world (according to Willamette National Forest Website). The water chemistry of the lake has been compared to that of distilled water. So that is worth running to the top of three unforgiving peaks, above 7,000 ft – to appreciate what lies before your very eyes. The fact that you can’t ever quite view the lake at lower elevations gives you even more incentive to climb to the very tops of Fuji Mtn (7144 ft at 15.9 miles), the Twins (7362ft at 44.8 miles), and Maiden Peak (7818ft 53.6 miles), respectively. I have one quick disclaimer before I begin, since there was a lot of disappointing moments for some of you, I am writing based on what I did to be successful and not to criticize or ridicule anyone! After a restless night before the race, trying to battle out all the nervous energy screaming through my body, I got my usual oatmeal down and finally the gun went off. Micah White, Ken Sinclair, and I went out for the early lead and started a nice comfortable conversation pace with Micah illuminating the lead. It was good to learn more about Micah and his awesome previous performances at Angeles Crest as well as his profession. Ken was there just behind giving us exact trail junctions and telling us more about the course. Thank you Ken for being there to direct us in the dark. Although he might have gone faster, Ken’s light went out which forced him to keep guiding us along our journey. After awhile, Micah dropped back and didn’t see him again. Sooner or later, the trail was visible without our lights. Ken and I screamed past the first aid and he stopped for aid at the Waldo Lake Rd crossing. I didn’t even think anything of it before hand but figured I could probably get away without stopping for aid until Fuji Mtn. As I climbed out of the Gold Lake, I started to realize where I was at in the race. I figured I’ll just keep going at my usual pace and sooner or later one of these relay guys will go zipping by me for that Fuji Mtn prize (i.e., North Face Bivy for first summit and on to finish). I arrived at the Fuji Mtn aid and still no one. This is when I started to ask the questions, Where’s Ken? Where’s Micah? I grabbed my pre-filled bottle of ultra fuel and started the ascent with a strong run/power walk to the summit. I couldn’t believe I was the first to summit. Craig and the gang were “in awe” that it was me to first summit Fuji. The View was amazing but didn’t hardly get to appreciate it with a quick 360 degree spin, barely seeing Waldo Lake and a quick photo of me with the prize. I was so thrilled but at the same time was thinking to myself what am I doing in the lead this early? As I headed back down, I yelled back “Is this a curse for later in the race for summiting first?” Descending down I saw Ken and then Steve Smucker not too far behind. I figured somebody will be catching me sooner or later. I got back down to the Fuji Aid, stripped down to my shorts and Patagonia silk long sleeve shirt and off I went. The Mt Ray aid was a pleasant surprise with all the people there cheering me on. I was extremely focused for a quick “in-and-out” in this aid but it was such a thrill to have so many people I know there, cheering me on. It felt like being in the Mac and at Robinson Flat (in Western States) at the same time. I had packed some pork and beans (Craig’s favorite) but by then all my stomach was allowing were Succeed caps, Gu and Ultra Fuel. I did have bananas and cantaloupe as well in the aid(s) but trying to down beans and maintain a lead, I figured probably would be disastrous later on. Didn’t want to repeat a Dusty Corners at Western where I was both Godzilla and Niagara Falls, simultaneously. I continued on and the crowd cheered once again. A short while after Mt Ray I got stung by a bee but no problem there. I passed a couple of hunters but they were on their way out and not actively hunting. I got to the Pacific Crest Trail (PCT) intersection and my mind was trying to remember the layout of the course. I just kept following the markings staying focused for the lead and concentrating on the trail markings looking for any possible intersection. The climb up to the Twins aid I started to feel a little fatigued but then started to take down the Hammer Gels/Gu/Cliff Shots one after the other. Shortly after I arrived into the Twins aid (mile 27) I heard the aid station captain call out, “There’s Second Place!” I looked up and it was Kelly Woodke. I downed a couple of cantaloupe and water and off I went. Now I was starting to feel the pressure. Much like maybe what Jurek gets at Western. I had this inspiring thought running through my head, something that gave me more energy to pull ahead. All I could think of was thinking like Jurek, “It’s time to make my move…RIGHT NOW! !” I hammered down to the Charlton Lake aid arriving there just over 6 hours. I knew by then that the course was a tough one and my total finishing time would be well over expected with all the climbs remaining in the second half. I was cheerfully greeted by Clem LaCava, Jason Moyer and several other good Oregon friends. I appreciated all the support helping me get my gear since I had no crew. Jason made the comment, “Are you gonna let Smucker catch you man? ?” I began to ask the questions, Where’s Steve? Where’s Kelly? Very soon after, the first relay man (Ken) came in and made the exchange. Shortly after, I grabbed some more cantaloupe and off I was like a bat out of hell. I then started to get the runner’s high on this leg up to the Rd 4290 aid. This leg had flatter hotter stretches that were painfully runnable, but I kept pounding at the bit to gain a greater lead. Only minutes into the Rd 4290 aid I saw some live shotgun shells on the ground and soon after heard a couple shots very close by. I started to yell out, “I’m comin through, hay! yoh! I’m co-min THROO-OUGH!! !” Right before arriving into the aid I yelled at Kris Krichko, thinking it was a hunter since he had an orange vest on. Curt Ringstad (co-RD) was there and helped me get my drop bags. He said that the Forest Service rangers have taken care of these kids that recently shot the guns. I was in relief. Curt reminded me to drink a lot in the next 8 miles and said it’s gonna be dry up there on the Twins. Curt wasn’t sure about how far back Kelly or Steve were but knew “I” still needed to work hard to maintain the lead. I grabbed my last drop bag gear and headed on my way. I pretty much ran until the trail became too steep and just power walked it when the trail gradient was steeper, ascending higher than my forehead. I approached Found Lake and “Found” The Twins towering above. I then began to ask myself, Where’s Mommy? I knew the Twins were big but not that big. I got up to the crest of the Twins divide, was confused, and asked myself “Where’s the Assault to the top of the Twins?” The trail was going back downhill and I knew we had to go up. I then realized I had stashed my map in a convenient spot and pulled it out and saw that the “Assault” was down a couple hundred feet. Upon approaching the Assault, I heard something coming from behind. I looked back and panicked but it was only the second place relay guy (Phil Orlowski). He was very supportive and gave me some encouragement for the climb up the Assault to the top of the Twins. I passed some high school kids that were coming down off the summit on my way to the top. They had tennis shoes on and were having trouble in the semi-loose scree. I made it to the top and Thank God they had water up there. I got my second view of Waldo, downed an S-cap and descended. I got almost back down to the Assault junction and had rocks in my shoe and I stopped to shake them out. Right after, Steve appeared and Kelly following close behind. I laced my shoe up, wished my best to them both and took off down to the Twins Aid. I figured they must have been at least 20 minutes behind me by then, give or take. Curt was at the Twins aid and he said I looked even better then the last time he saw me, which was encouraging. 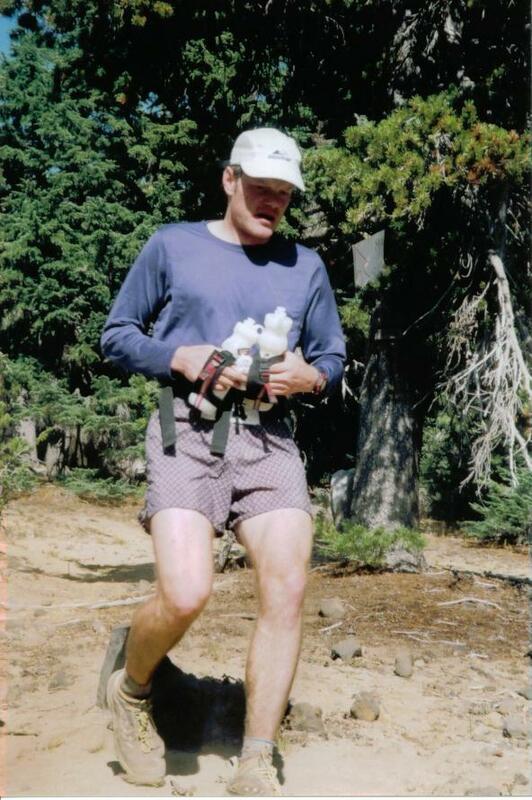 I continued to run strong down hill on the PCT. I arrived at the Bobby Lake junction and consulted my map for clarification for a second and realized that the turn off was further down. From that point the trail once again was flat and painfully runnable but still I pushed until it got steep on the climb up Maiden Peak where I could finally power walk. I arrived into the Maiden Peak Aid and Craig was there helping out. It was good to see Craig there with the encouraging words that I may have this race made, but I still knew “I” had to work it to maintain the lead. I power walked and ran the benches going up the first part of the Maiden. After awhile, the hillslope steepened changing from convex to concave which made the climb even more strenuous and the running thing came to a halt. Even power walking was a little extreme. I FINALLY reached the Leap of Faith where John Ticer and Kevin Myers were eagerly waiting with some food and water. They gave me some Gu and water and I went for the summit. I just about reached the summit and Phil was just coming back down. There were people at the very summit where I filled up on some water, got my final view of Waldo and other beautiful views of the Three Sisters, Diamond Peak, Odell lake and the entire course I had just run and then descended. I got back down to Kevin and John and they gave me another Gu for the long descent. I urinated and noticed how bright yellow it was. OK, gotta drink more, although it might have also been the Gatorade. I didn’t see Steve or Kelly at that point and knew I had a good lead, but knew I still had to work hard downhill. The steep descent down from the Leap of Faith was rocky and technical but not more than a few minutes and you were back on the nice soft duff trail. I descended down into the Maiden Lake aid where Barbara Ringstad, John Leibeskind and other fabulous folks were blowing horns and kazoos. The Frappacino didn’t look very appealing but the Hammer gel and once again cantaloupe and bananas were good enough for me. My stomach was then asking the question, Where’s the real food? As I was leaving, I said, am I allowed to walk these hills? I power walked most of the hills around Maiden Lake but ran down the final descent on the PCT to the finish. I decided I didn’t want to beat myself up completely with only 3 weeks before Mt. Masochist. I arrived at the Rosary Lakes forgetting about the flat stretches but still ran them. Driving down the final hill viewing Odell lake and finally hearing highway 58 was a sure sign of relief. The final stretch into the finish was an exciting moment. For a brief moment I felt like Prefontaine with crowd cheering for me into the finish line. I was glad that was over with. Most of the people cheering me on had already dropped. This made me feel even better, that they were even enthusiastic no matter what happened to them! I admire all who gave it their best shot. I have gotten lost before in other races and know the feelings or trials some of you went through. I think that is the main thing that made me more alert for those important intersections – I had learned from experience. I can’t help to ask one last string of questions: Where’s Jurek? Where’s Emerson? Where’s McDowell? Where’s Torrence? Where’s Pirc? Where’s Moehl? You guys/gals want a good challenging course? This is the one for you, with no pun intended!! I know my established course record or first Fuji Mtn will not last long. Craig and I agreed as long as the Relay becomes more popular the “double” Fuji Mtn and win will also get harder and harder to capture. I found a race that couldn’t have had a better selection of fabulous volunteers that were so enthusiastic and supportive in aid stations and elsewhere on the course. I found a race that had a well balanced selection of sponsors. I found a race that had race directors with huge amounts of ultra experience and a willingness to go the extra million miles to please every single runner. I found a race that captured me in a dream-scape spiritual place, filled with beautiful single track trails and breathtaking views. All of these things is how I found Waldo!